How valuable is feeding raw due to a balanced nutrition? With a ratio of 70% of the protein fed originating from animal sources (meat, innards, eggs) this food can be considered a very high quality food. Besides, all ingredients are human grade. While there is nothing wrong about feeding your dog SOME veggies, a high quality diet for your Bull Terrier or any other dog should always be MEAT BASED. Meaning it contains more animal protein than plant protein. So please keep that ratio, if you want to feed high quality. After all, you probably have good reasons to look into the – less convenient than kibble – raw feeding model. Probably because your dog has allergy issues or problems with yeast or her digestive system. Also you likely already know that feeding some kinds of commercial foods can contribute to these problems big time, or even be THE cause. So, you definitely do not want to compare to the quality of cheap processed kibble food by making your homemade dog food PLANT BASED! Actually, according to a lot of experts in dog nutrition your dog technically does not need any veggies at all in her nutrition, but could live of meat and bones only. We add the veggies to relive our wallet at least a little bit and bring variety in amounts that do not harm our dogs. 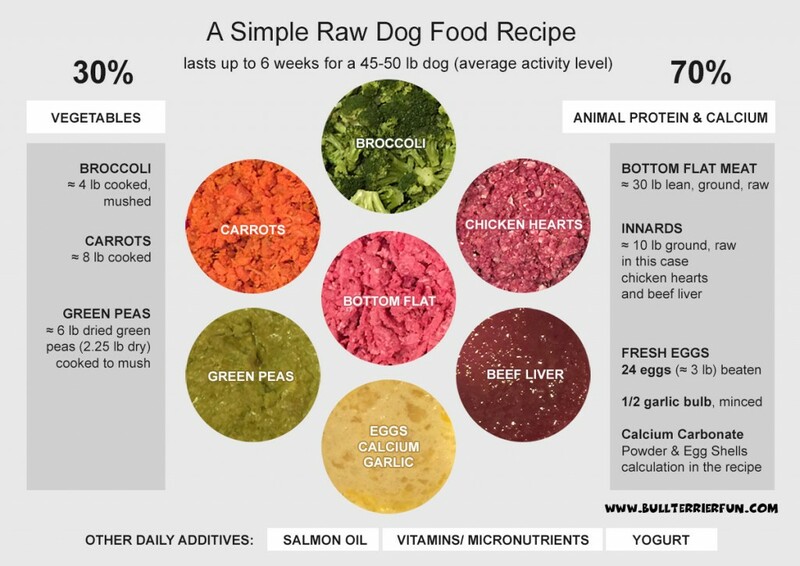 With a ratio of only 30% of the protein originating from veggies, the low fat content, being grain-free and without any enhancers, also not containing highly processed ingredients or by-products, raw food recipes like the one here beat many of even the most reputable brands of commercial dog foods, dry or wet. Keep in mind that while being extremely healthy for your dog, you may need to add some minerals and vitamins, most of all Calcium. I will get to those additions also later in this post. Preparing a batch for up to 1 1/2 months will take a few hours and require a fair amount of kitchen utensils, as well as enough storage space in your freezer. Keep that in mind and don’t forget sanitizing afterwards.